As a lot of you know I have been suffering severe depression for a couple of years now and it has taken ages to find the right meds to balance my brain chemicals out, but I think we are finally there. The better weather is certainly helping, and the getting out and about on my own a bit too. I am working on a little project with Valerie as she does great pencil sketches and paints, and digital art. I am hoping to incorporate it with my efforts which have come to a grinding halt but I have plans for expansion and marketing for the near future. I am hoping that we are not heading for a,other drought because we have had no rain, the pastures are bare still and we normally start getting our first cuttings from the farmers in May. I will have to go and check out their fields. I just hope their prices come down a bit but with diesel at $4.40 a gallon plus I am not holding my breath. I have finallly started getting sawdust again so I am getting all the stalls stripped, even with most of the horses out 24 7 and preparing them in case they are needed. 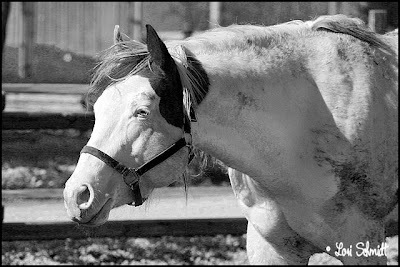 Beginning of May I have to decide on 4 - 6 horses to send to the pasture down the road which will be a help. I want to start working on Dosie and Cayenne first as they have the most experience under saddle, hopefully get them onto the trails if nothing else and make them safe rides which they really are already, they just need the miles put on to them. Most importantly I have to start getting my readership up, my posts interesting and drawing more people to my site and photos and gifts for sale so that I can feed my brood LOL. I love it when a plan comes together. This one has taken a long time to get it done but I think it will be worth it in the end. When I started having the problems with the yearlings getting through the fence (electrified) in the enclosure attached to the barn and getting i to the neighbors gardens, I decided that I had to make this area secure for the stallions and any babies and for Gee who is a thoroughbred who boards with us. 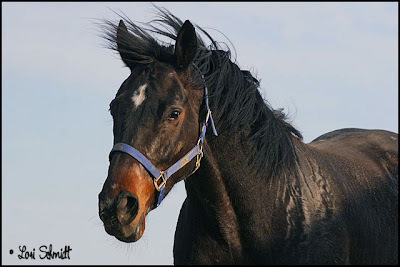 My biggest fear is a horse running through a wire fence because it cant see it, similar to what happened to Taxes when he was 4 months old. So I planned this wooden fence which everyone thought I was crazy to do, had to go with cheaper lumber and landscape posts were cheap at that time so that is the direction I went. Then to protect the wood from chewing , white electric tape fence to add security. That way I knew it was secure, could be seen and was unlikely to have escapees. Gee (racing name Geared)was my main motivation. Her owner has not been able to find a trainer to take her on, he has been messed around by trainers for the last 2.5 years so G has spent most of that time with us. 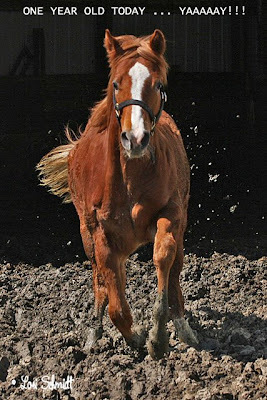 Her only free time out of her stable has been in the roundpen where I was terrified she would put a foot through a rail while she rushed around madly because she had so much energy, or in the bottom half of the barn before I had to make it into stables for the winter again. The day Gee arrived I fell in love with her, she is now a 17 hand 5 year old mare and has one of the nicest minds I have come across in a thoroughbred, she is amazing and I would love to ride her but dont have anywhere here where that would be safe. Yesterday for the first time I relented and put her out. It is very muddy at the doorway to the barn and generally the horses dont like the mud and will avoid going out rather than run through it. 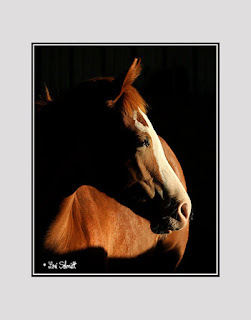 She is also now very stall bound from spending so much time in the same place and surroundings and her insecurity kept her close to the barn which was a blessing. At first she ran a round like a mad thing, but the fence was perfectly clear to her and she knew exactly where the boundaries were which is exactly what I wanted to achieve. She stayed close to the barn and when I went out into the area she walked around with me. There is absolutely no grass here at the moment, just mud and dried lumps from the hoof ruts which hurt their soles inside the hooves to walk on. Within 2 minutes she was puffing like a steam engine and sweating like mad but this is just the type of exercise that this poor mare needs, a few weeks of regularly being turned out for a few hours and she will be far easier to handle and probably ride. So hopefully when this becomes a regular exercise she will stop wanting to hang around a the barn door and learn to move around a bit more out there, I am going to start feeding her out there which will settle her too. The pictures are ones I took late yesterday afternoon while she was doing her thing LOL. I love this mare and only hope that if he decides to get rid of her that he will give me the option of having her even if I have to pay her off. That's it for today, it has been another long day, we started with an earthquake this morning at quarter til 6am. There is a fault line that runs from southwest Illinois in a north easterly direction up through Indiana and affects us when it moves which I dont think happens very often. So that is the excitement for the day LOL. I have been running i mad circles all day trying to get things done, am finding a bit more energy and motivation but there is so much to do. It was 9.30pm when I sat down here to look at my computer eventually. ((((*Hugs))))) have a great weekend everyone. Two Birthday Boys - 15 April!!!! When Blue was born, he was the first baby I actually watched being born, he was exceptional in every way. I was still very inexperienced and he was the third baby that had been born since my arrival. He had the most beautiful way of moving with his mile long legs. 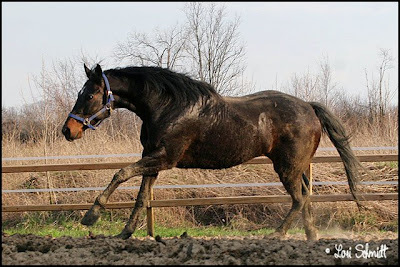 He didnt trot or walk he just loped or cantered with this amazing ease everywhere. You can find a picture of him with his momma at a few days old at the bottom of this page. He is 5 years old today. 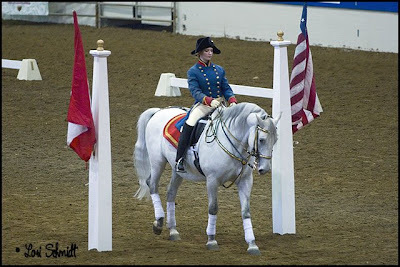 http://groups.msn.com/doubleLpainthorses/dbdblueyedwonderbarforsale.msnw . So he is my other Tax day baby along with the Brat, aka Mikes not so little buddy, aka Taxes. Below is a shot taken by a friend a few days ago, I have no pictures of me and my horses so unfortunately they normally come at inoportune moments when I look like hell and an old hag!! And here is the star of the show. It is hard to believe that he is already one year old. I was trying to entice him out of the barn to have a run this morning because the weather is beautiful but the area outside the doorway is very muddy and he didn't want to get his little hooves dirty. Well I eventually went into the enclosure to see if that would entice him out. It did and this was the only shot I got because he was making a B-line for me to come play!!!!! I ran like the wind and climbed through the fence LOL. Bear in mind that this yearling is probably the same size as all of my other fully grown horses and weighs 900 - 1000lbs! Our weather as you all know from my constant complaining has been dreadful for weeks now but it is beautiful and sunny today although in the 30s or 40s still, but I will take it. That is all the excitement for today I am afraid. (((Hugs))))) to you all and thanks for visiting. This looks as if it is going to turn into a weekly blog, it started out beginning of last year as a Photo A Day, but I suppose I am still here and it is nice to have this sort of diary to look back on. I put Taxes out for a run a fe days ago and he is not partial to mud so didnt get many chances at getting a decent shot of him. 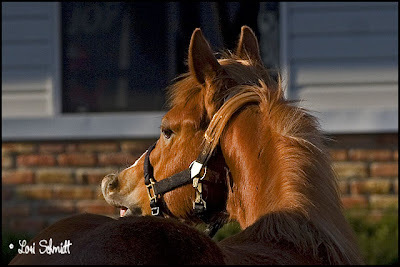 I thought this one was cute, he was looking over to where the mares were and lifting his lip LOL. I got three more round bales this week for the girls and Dosie in the field, and this one collapsed quite easily much to the delight of Wiggle who decided it would make a nice soft dry place to take a sleep LOL. Later on I saw Dosie and Lori taking a sleep on it too. Well after having those glorious days of sunshine and 50s and 60s we are expecting a freeze tonight and have barely made it out of the 30s for the past 3 days. On Tuesday Taxes will be 1 year old. Can't believe it, it had snowed the day before and was freezing, we had three inches of slushy snow on the ground and I was in the barn at 1.30am helping get him cleaned up and dried and blanketed and finding the milkbar. The local art exhibition starts tomorrow, we dropped off all our pictures on Friday and Saturday and I didnt get to go to the reception this afternoon as I was feeling a bit off (the cold weather didnt help). So now I need to get myself woken up and get some work done. 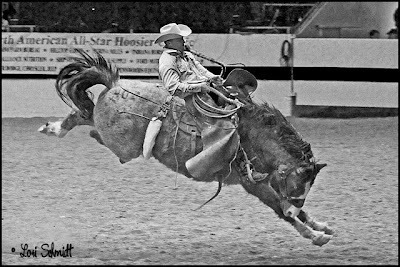 As I said on Friday I was off to the Hoosier Horse Fair which I have wanted to do every year but never had the opportunity because Larry has been bedbound so when Val and her friends and her daughter and her friends invited me to come along I took it on. 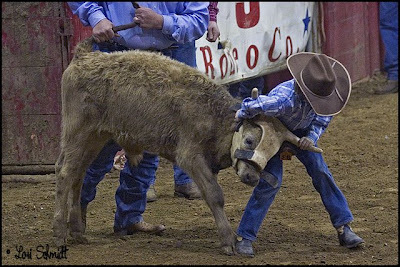 This little guy is steer wrestling, he is actually about 6 - 8 years old and it is a claf. They have to catch them around the horns and turn their heads and pull them over and down. This calf was having none of it, the boy was laying on his back with the calves head upside down on the ground but the rest of his body refused to go down LOL. This is an event called cow milking, there are three or four cowboys on the ground and one mounted. They have to rope the cow, keep her under control which means hanging onto her head tail or whatever and then the one cowboy has to milk her into a bottle(like a small beer bottle), just a little will do, they then have to release the cow and run into a designated area for their time to end. The group that does it quickest is the winner. This is good old bucking bronco, but as you can see it is a slightly tamed version as they have saddles and stirrups, but it was very entertaining. They also had a smalll Lipizzaner exhibition, not wel experienced horses and they didnt exhib a lot of the more difficult moves, but they are beautiful horses. It didnt help that the power went off for a few minutes right in the middle of the exhibition LOL. I felt like I had been hit by a truck the next day because we left at 9am and got home at about 11pm and I have never walked so much. You could buy anything equine there for sure and it was nice seeing the exhibits of some of the disciplines and breeds as well as running into my horse show friends. I will post more over the next few days, there was so much happening and I still havet realy looked properly at all I shot. I have muscles that I forgot I had in my upper legs LOL, geez I am out of shape, I am going to die when I start riding regularly again!! This is just another quickie again I am afraid. The horses have finished their roundbales already!!!!! We are still a sea of mud, it has beem a dark gloomy wet warmish day and I feel the same way. 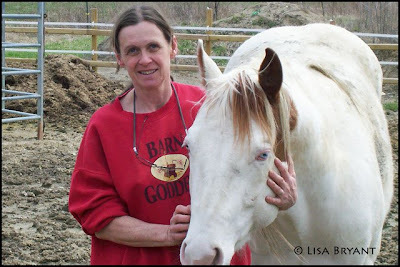 I am going to the Hoosier Horse Fair tomorrow with some friends, it may be a long day but I am looking forward to it. 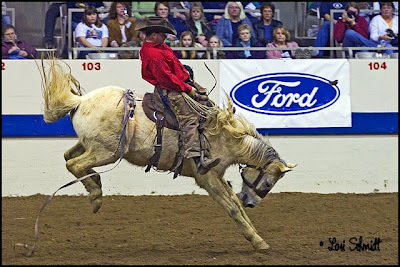 It is like a trade show for the horse industry and is held in Indianapolis each year and they have showcases of stallions and different horses, disciplines and breeds. So we will see how I hold up. Abraham I am so sorry to hear that you have been in hospital but glad you are on the mend. I am getting further and further behind on everything. 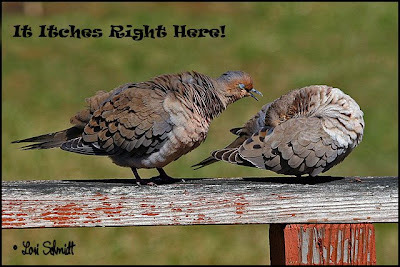 (((((Hugs)))) to you all that keep checking in. Have a great weekend and hopefully I will have a picture or two from the show to post on Sunday. 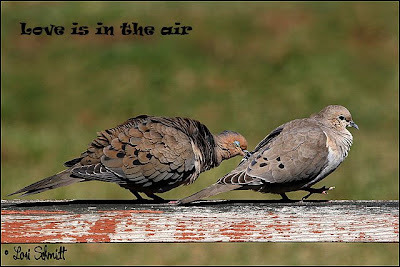 I am getting my post in early today, as I have missed a few again. 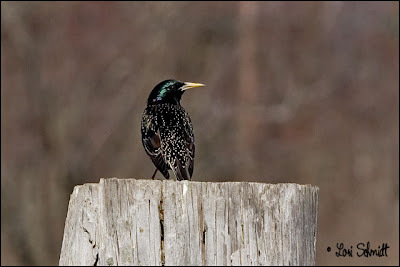 This is a picture of a starling that I saw while walking outside the other day, I had to crop it quite drastically because it was pretty far away but I liked the way the feathers were glistening. Yesterday I posted on my other blog http://loriscritters.blogspot.com/ a picture of one of the little hawks I have noticed flying around here recently. 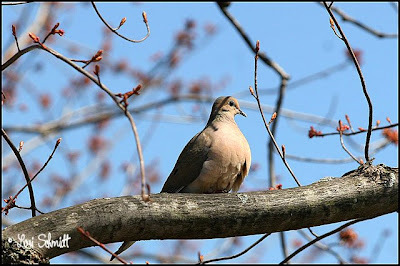 I dont think it is the same as the one I saw a week or so ago and only got one shot of it before it flew off. Check it out and see if you can identify it for me please??? I also posted a pic on there of my View from my kitchen window. Would you believe those 5 mares have completely anihilated that whole round bale (Cat Piglette and the 3 fillies) already in 6 days. I am still not really happy about having it out there because of potential mould which I know is present, but they have really enjoyed it and are still eating their grain normally and are much more content than standing in complete boredom. It rained all night so it is a mess out there this morning and after getting to the 60s yesterday we will be in the low 40s today with 25 - 30mph winds again!!!! 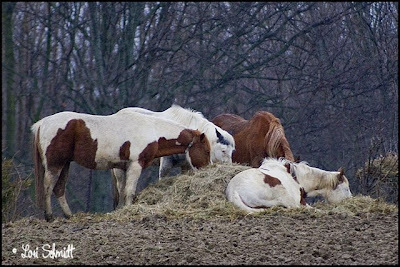 I just dont have any horse pics to post because they are so muddy but will try to add a few mud shots a bit later to give everyone their horse fix. Hope all is well with everyone (((((Hugs)))))) I have finally resolved myself to the fact that I am never going to catch up and will just do what I can to keep in touch with you all LOL, but know that you are always in my thoughts.